The SEAT Leon CUPRA has always stuck closely to a top performance and value per pound ethos. Now, with immediate effect, it is taking the fight to the hot hatch elite with the latest 300PS versions becoming even more tempting through savings of up to £1,945. The revised pricing applies to all three Leon CUPRA 300 bodystyles, SC (Sports Coupé), five-door and ST (Sports Tourer). The Leon SC CUPRA 300 DSG-auto benefits from the largest saving, with £1,945 taken off of its previous price. The best-selling five-door and ST are just a smidgen behind losing £1,905 respectively. 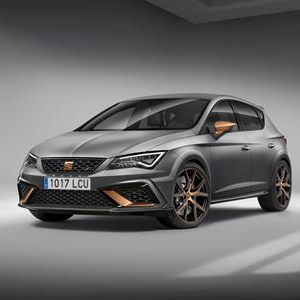 At the same time, and making a Leon CUPRA 300 purchase even sweeter, SEAT has chosen to offer customers the chance to opt for its six-speed DSG-auto versions for no price premium over the six-speed manuals, which is typically a £1,350 additional cost. The three manual versions each see price reductions of £555 too. In spite of the price realignments, the Leon CUPRA 300 range still retains its impressive equipment levels. Among its core ítems are 19-inch CUPRA alloy wheels, SEAT Drive Profile, Dynamic Chassis Control, auto lights and wipers, Full Link (integrated Smartphone connectivity: MirrorLink, Android Auto and Apple CarPlay) and dual zone climate control. Leon CUPRA 300 models (excluding CUPRA R) will also be the first cars in the SEAT range to receive Digital Cockpit, adding value and enhancing the interior of the Leon flagship even further. As seen in other Volkswagen Group products, the technology-led driver-configurable display can be viewed in one of two modes, presenting four types of information: communication, driving, media and navigation. The multi-function display is a compact information unit, positioned directly in front of the driver on the dashboard for convenience and safety. It allows the driver to see important information at a glance, without taking their attention from the road. Making the Leon CUPRA 300 offer even more accessible is a new finance PCP offer for retail customers, at £349 per month with a £1,500 deposit contribution and 5.8% APR (full details are outlined below).